A bar chart is helpful in graphically describing (visualizing) your data. It will often be used in addition to inferential statistics. For example, a bar chart can be appropriate if you are analysing your data using an independent-samples t-test, paired-samples t-test (dependent t-test), one-way ANOVA or repeated measures ANOVA. If you are using a chi-square test for association or a two-way ANOVA, you will need to consider a clustered bar chart instead (N.B., if you need help creating a clustered bar chart using SPSS Statistics, we show you how in our enhanced content). 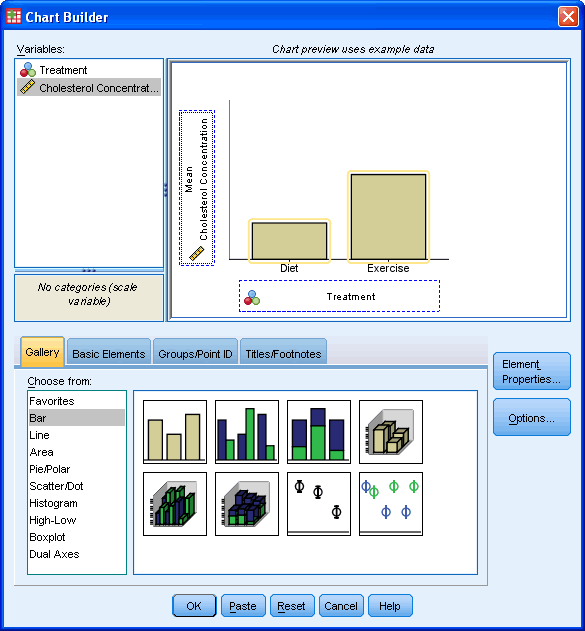 The purpose of this guide is to show you how to create a bar chart using SPSS Statistics. Before we show you this SPSS Statistics procedure, we introduce you to the example we have used. The concentration of cholesterol (a type of fat) in the blood is associated with the risk of developing heart disease, such that higher concentrations of cholesterol indicate a higher level of risk and lower concentrations indicate a lower level of risk. If you lower the concentration of cholesterol in the blood, your risk for developing heart disease can be reduced. Being overweight and/or physically inactive increases the concentration of cholesterol in your blood. Both exercise and weightloss can reduce cholesterol concentration. However, it is not known whether exercise or weightloss is best for lowering blood cholesterol concentration. Therefore, a random sample of inactive male individuals that were classified as overweight were recruited to investigate whether an exercise or weight loss intervention is more effective in lowering cholesterol levels. This sample was split into two groups: one group underwent an "exercise training programme" (labelled "exercise" in the bar chart), and the other group undertook a "calorie-controlled diet" (lablled "diet" in the bar chart). In order to determine which treatment programme was more effective, the mean cholesterol concentrations were compared between the two groups at the end of the treatment programmes. Therefore, the dependent variable was Cholesterol Concentration, and the independent variable, Treatment, which consisted of these two groups: "exercise" and "diet"
Note: The example is based on the data from our "quick start" independent-samples t-test guide. If you want to analyse your data using an independent-samples t-test, our "quick start" guide will help get you started. The 13 steps that follow show you how to create a bar chart in SPSS Statistics using the example above (N.B., if you need help creating a clustered bar chart using SPSS Statistics, we show you how in our enhanced content). 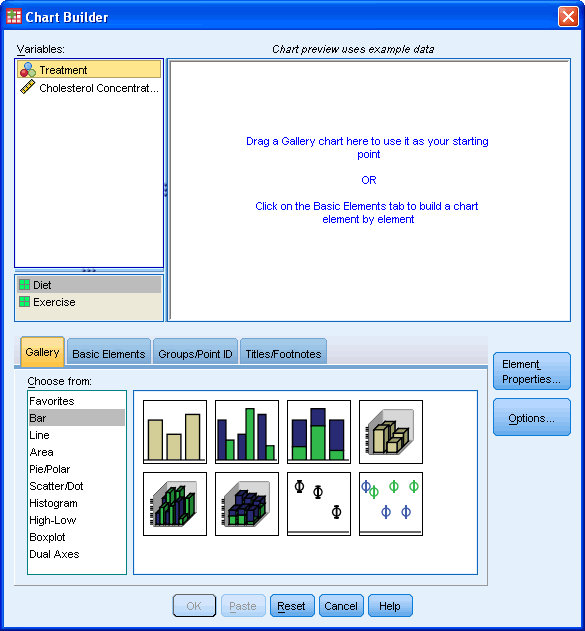 Under the Gallery Tab ( ), select the Bar option and the simple bar chart icon (top-left icon). Drag-and-drop this icon into the Chart Preview Area. You will be presented with the following dialog boxes: Chart Builder and Element Properties. As you can see, the Chart Preview Area has been populated with a template of a simple bar chart. Transfer the independent variable, Treatment, into the "X-Axis?" box and the dependent (outcome) variable, Cholesterol Concentration, into the "Y-Axis?" 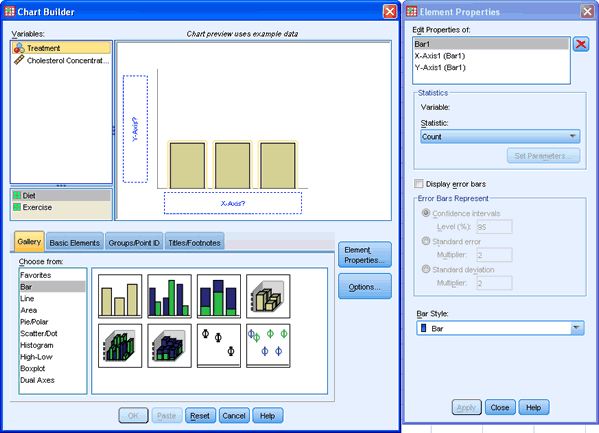 box within the Preview Chart Area by drag-and-dropping the variables from the Variables: box. 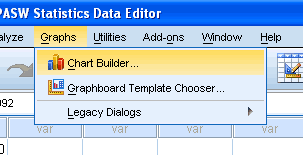 Steps 6 to 13, as well as the SPSS Statistics output for the bar chart you are creating are displayed on the next page.